Carlmont's Greg Surh, left, and Brad Surh finished second and third in Division I of the CCS meet to lead the Scots to their second straight title. Oh, brother. The Carlmont boys' cross country team has two runners linked by blood as well as uniforms, and together they're leading a charge against the state's best. Meet Greg and Brad Surh, the Daily News Athletes of the Week. "You race mostly on instinct, but it seems like him and I have the same instincts when it comes to cross," Greg said. "It's the simplest sport, you just run," Greg added. "You don't have to catch a ball, but it physically takes so much out of you. The moment you step onto the trail, you know you're going to feel uncomfortable. Every one of us has mastered dealing with discomfort, pain, uncertainty, fear. Yet, if you saw us in the hallways, you wouldn't know it." At this past Saturday's Central Coast Section Meet held in Toro Park just outside Salinas, the Surh brothers finished second and third as the Scots won their second consecutive CCS Division I title. Greg, the 17-year-old senior, led the way with a time of 15:52, finishing with the best-ever time for a Carlmont runner at Toro. Better even than Kyle Shackleton, who along with twin brother Drew led Carlmont to a surprise second-place showing in 2003. That was Greg's freshman year, back when he still had hoops dreams of his own. "Throughout my entire my childhood, I never really excelled at any sport," Greg said. "I kind of tried a little bit of everything and nothing really stood out." Cross country for him was originally a way to stay in shape for basketball, but after not making the team his freshman year, the Shackleton twins invited Greg to watch them at state. "Once I saw that, I knew exactly what I wanted to do," Greg said. "From then on I focused entirely on distance running." Brad, the 16-year-old junior, stands 6-feet tall, or about two inches taller than his older brother. Brad, who came in nine seconds behind Greg at Toro, crossing the finish line at 16:01, is the track athlete between the brothers, running anything from the 400 meters to the 2-mile. "Everything is faster," said Brad, who played soccer for over 10 years. "I had a lot of natural speed, so track kind of came natural to me." He originally didn't want to run cross country, but head coach Jeff Gilkey sent Brad time and time again to recruit his brother. "He kept bugging me, so one day I just came out in basketball shoes and basketball shorts and I ended up running with these guys," Brad said. "Then I just decided to keep running and I did pretty well. "Greg runs more off his strength and I run more off my speed," Brad added. "He's able to hold a faster pace for longer." While Brad makes up a lot of ground in the last half mile with his kick, Greg relishes the hills, where he made up a lot of the ground on Saturday after going much of the first half of the race behind the lead pack. "While everybody else likes to slow down when they get to hills, I've never really met another runner that can climb quite as well as I can," said Greg, who feels free running in the trails. "There's a lot of runners that can out-sprint me in the track that I can easily beat in cross country." Though they will always be linked to the Shackleton twins, the Surh brothers would much prefer to be associated with Nick Palladino and Chris Pedro, who finished sixth and seventh respectively at the CCS Finals. "A lot of kids at this school, despite the fact that our teammates work just as hard as us, it seems like all this focus from students centers around the Surh brothers," Greg said. "Every day, we run off and people point at us and, 'Hey, run Forrest, run.' There's so many times we've heard that and it drives us kind of crazy sometimes." This team has its own identity and two runners alone a CCS champion does not make. "We pretty much do everything as a group, which is why our team was so close together," Brad said. "Our top four is what makes the team really strong." This December, Greg turns 18 and his high school cross country career will be over. So as he looks on the rest of the team, he thinks of the past and the future. "They're so much what I was like three years ago - innocent, happy, free, almost goofy," said Greg, who enjoys creative writing and likes to shoot movies with his friends. "They kind of do strange, silly, weird stuff. I kind of smile when I look at them, because I remember being, 'Wow, was that me three years ago? Did I really look that young?' They seem so much younger, but yet they're not. But after seeing what they can do, I feel really comfortable leaving because I feel like I'm leaving it in very good hands." Like those of his younger brother, who has never needed anyone to look over him and will get his chance to prove it in 2007. "It's going to be a lot different," said Brad, who races with his brother one last time in a little over a week at the State Finals held at Woodward Park, Fresno. "Greg brings leadership to the team without leading at all. He leads by example and that's going to be gone. But hopefully me or somebody else will step up." Who knows? 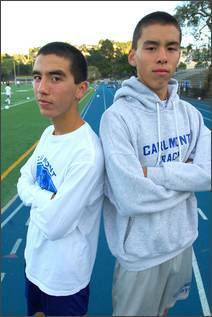 Maybe another set of brothers will start running the trails for Carlmont. E-mail Vytas Mazeika at vytas@dailynewsgroup.com.